Exciting news: You have a reason to celebrate. Whether your company’s been in business for one year or one hundred, you have plenty of opportunities to share your brand through noteworthy events on the socialsphere. You can congratulate a co-brand, party on your anniversary, mark a “first” for your business, or share your company history by storytelling with photos. Social media provides the perfect platform for drawing your customers into celebrating with you for all minor and major milestones. You can start recognizing milestones on social media by supporting co-brands when they have cause to celebrate. 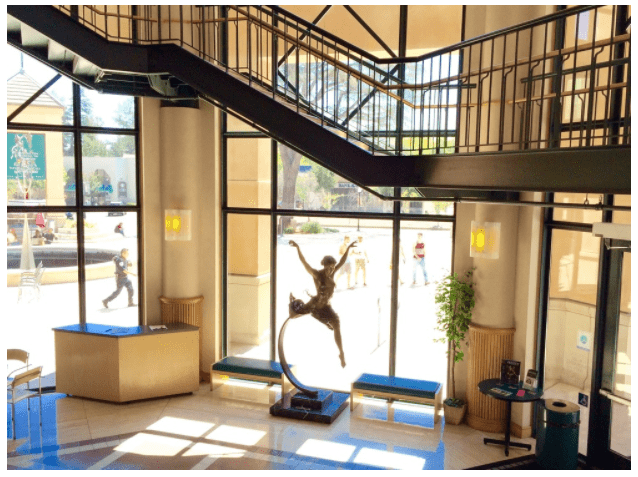 The Mountain View Center for the Performing Arts celebrated their 25th anniversary this year. The center held a free performing arts event for the public. 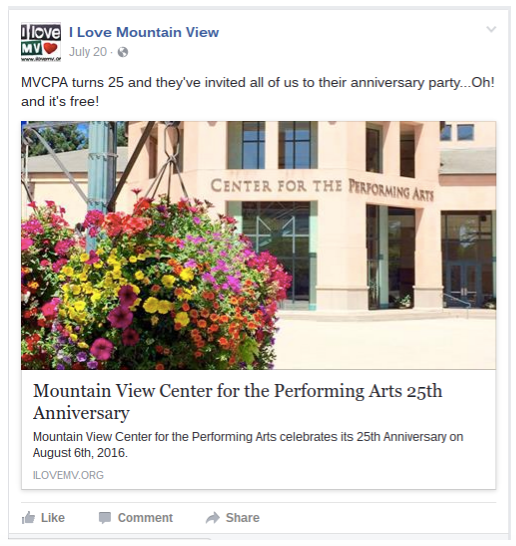 The City of Mountain View posted the event to their “I Love Mountain View” Facebook page. With this simple act of generous digital marketing Mountain View shows their social media base they support the MVCPA. Social media followers appreciate a brand that can act genuinely. Nothing shows the sincerity and goodwill of your organization like congratulating a partnering company. This gesture is easy to organize: enter others’ milestones into your editorial calendar when you list out your own. 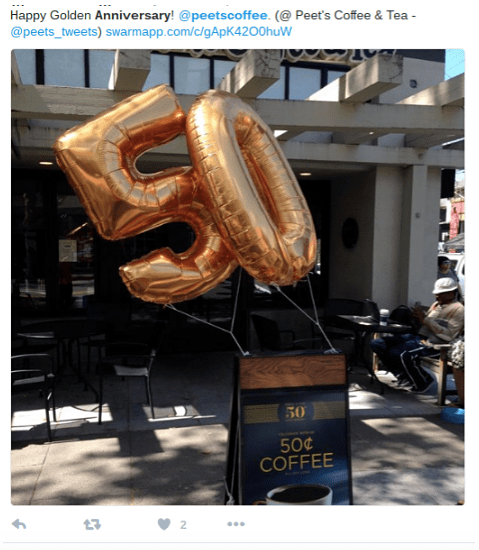 Peet’s coffee celebrates 50 years in 2016. On April 1st, the coffee house sold cups of coffee for $.50 to commemorate the day. Customers were so excited about the deep discount, they took to social media to tell everyone about it. Customers in the Bay Area in particular flooded Twitter, sharing photos of their local Peet’s Coffee from Palo Alto to Berkeley. 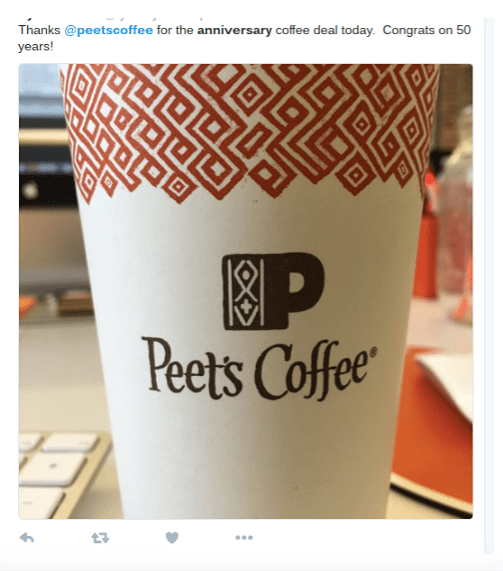 Peet’s coffee hardly had to tweet or post about their anniversary deal that day: happy customers did it for them. Gathering true excitement about your milestone in-person will naturally encourage customers to share it on social media. Double your efforts by sharing your photos of the event on all your social media channels. The National Park Service found a simple way to tell the Facebook community they have a reason to celebrate. For their 100 year anniversary, the NPS changed their cover photo to a park ranger hat covered in glittering confetti. Anyone who clicks onto their Facebook page knows the NPS is celebrating an important milestone. Your cover photo sets the tone for your company’s social media page. Changing it to an image marking your milestone let’s social media followers know it’s a big deal to your organization. The NPS garnered over 7,000 reactions from this one, simple image. Draw attention to your milestone– and your company– by placing the party, new product, or event front and center on your social media page. Companies with a strong organizational culture tend to celebrate milestones naturally, whether it’s eating cake on employee birthdays or a catered lunch when a big project is completed. These moments are perfect for sharing the heart and soul of your brand on social media. Twitter hosted a 10th anniversary campaign looking back on a decade of memorable tweets. The company created a timeline of memorable tweets, from the happy to the controversial, and sent it out to show social media who they have become after ten years of business. You can take the opportunity on anniversaries to show the evolution of your branding from the beginning to now. Storytelling through photos and posts on social media brings your company history to life for your clients who follow you. No milestone is off limits, and you can create a big stir with a far less significant event than a tenth anniversary. Nike, for instance, marked the anniversary of their first fan hashtag on Instagram with a 24-hour photo-sharing campaign. 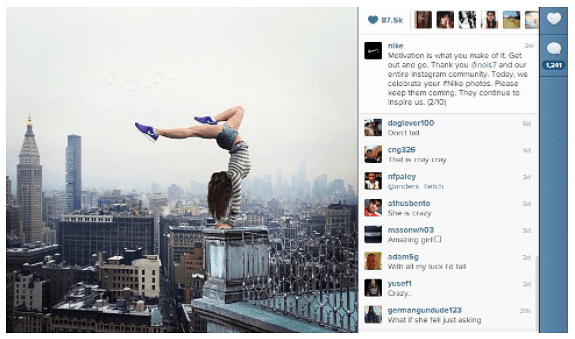 By encouraging instagram followers to share motivational photos, Nike generated 4,900 comments and 600,000 “hearts” in a day. This goes to show any marker for your company is a reason to spread excitement about your brand.